Whitley Bay staged a remarkable come back with three goals in the final 20 minutes to earn a draw on their first ever league visit to Ryhope CW. Eight goals, three penalties and a stoppage time equaliser added up to the entertainment at the Ryhope Recreation Ground. For Whitley the result felt more like a victory having appeared destined for a heavy defeat when 4-1 down with an hour gone. Defender Ross Wilkinson was missing through illness but there was a welcome return from injury for Andy Robertson while Peter Glen-Ravenhill was preferred to Tom Potter in the starting line-up. 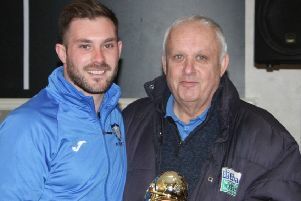 The hosts included former Bay manager and FA Vase winning captain Leon Ryan in their side and were looking to continue their climb up the table in their first season in the top flight of the Northern League. They wasted little time in getting on the scoresheet as in their first attack James Ellis rounded Tom Flynn and slotted the ball into an empty net with just four minutes played. Whitley got back on level terms after 13 minutes following a foul on Andy Robertson. Callum Patton’s expertly flighted 20-yard free kick cleared the defensive wall and crashed off the underside of the bar on its way into the net. As the half progressed, Whitley had chances to go in front and Thibault Charmey’s spectacular overhead kick was only kept out by a fine full length save from former Bay keeper Jonny Ball. Robertson then broke clear but his attempted chip over the keeper flew wide. A second effort by the returning striker was not far off target, but then seven minutes before the interval, Ryhope regained the lead when Elliott Woods was given a free header in front of goal from a corner. A 30-yard shot from Chris McDonald just cleared the Ryhope bar, then almost on the half-time whistle the lively Robertson burst through again but was denied by Ball. Five minutes after the restart, Ryhope were awarded a penalty in somewhat controversial circumstances and Nathan O’Neill put his side two goals in front. Whitley needed a quick response, but after Aiden Haley’s header from Callum Patton’s corner was saved, play switched to the other end and Flynn was penalised for a push as he tried to grab the ball and referee Shane Sugden pointed to the spot for the second time, with the same outcome, O’Neill converting to put Ryhope into a seemingly unassailable 4-1 lead. Bay made a triple substitution with Liam Brooks, Kyle Patton and Tom Potter all coming of the bench for the last 25 minutes. They needed a lucky break and they got it on 70 minutes when Kyle Patton went to ground in the six-yard box and referee adjudged that he had been fouled and awarded the third penalty of the game. The decision was hotly disputed by the Ryhope side but when calm had been restored, Callum Patton confidently despatched the spot kick. They pushed forward with renewed energy and Ryhope began to find themselves under increasing pressure. Eight minutes from time, Brooks took the ball to the by-line and cut it back across goal where Kyle Patton tapped it home from three yards. Whitley poured forward in search of an equaliser. With the game entering stoppage time, Liam Brooks had a shot pushed wide, but the never-say-die attitude of the Bay side reaped its reward following continued pressure when in the final minute of added time Brooks gleefully lashed home the equaliser from close range. It was his first goal in Bay colours and was a deserved reward for a battling performance by the young former Alnwick Town striker. Whitley Bay: Flynn, Gilbey, McDonald, Allen, Anderson, Haley, Glen-Ravenhill (Potter 65) C Patton, Robertson (Brooks 65), Charmey, Kempster (K Patton 65). Subs not used: McCarthy, Moore. On Saturday Whitley Bay entertain Bishop Auckland at Hillheads, kick-off 3pm.